The point of departure for the exhibition is T.J.Clark's recent book, "The Sight of Death (An Experiment in Art Writing)", in which Clark returns over and over again to two Poussin paintings over a period of six months. The book, a mixture between art history, diary and, at times, political reflection, is a day-to-day account of the fact that art never reveals itself fully in an instant. The exhibition suggests that Clark's rather privileged encounter with art can be a reminder of a form of engagement that is the very opposite of the currently prevalent condition of viewing in an ever-accelerating world, awash with art fairs, biennials, and counter-biennials. The desire behind the exhibition is to - somehow - bring about a feeling of time slowing down, of allowing our perception to unfold in time. The works in the exhibition, though very disparate, offer or induce private and intimate encounters, sometimes addressing our less rational and marginalized senses. 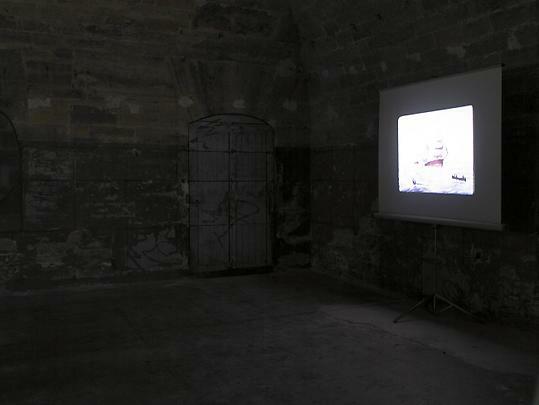 The exhibition spans over two floors, with the works on the first floor focusing on more unmediated experiences. 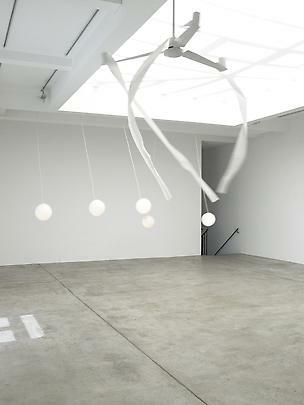 Gabriel Orozco's "Ventilator", 1997, the first work one encounters, sets the mood for the exhibition. In one of his deceptively simple and seemingly absurd gestures, Orozco places toilet paper on top of a fan transforming the domestic object into a magical kinetic sculpture, abjectness is turned into the enchanting. 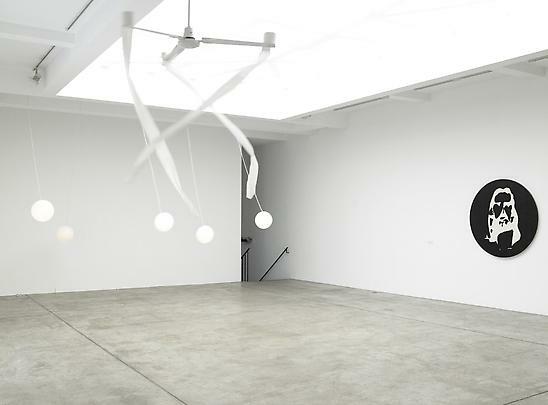 The ventilators animate the air in the gallery creating the most gentle of tactile and aural experiences. Oswaldo Macià's multi-sensory installations focus on our marginalized, least-knowable senses, smell and hearing. Having grown up in close proximity to his father's pharmacy in Cartagena, Columbia, Macià is fascinated by more emotional and abstract modes of comprehension which have been side-lined since the Enlightenment. 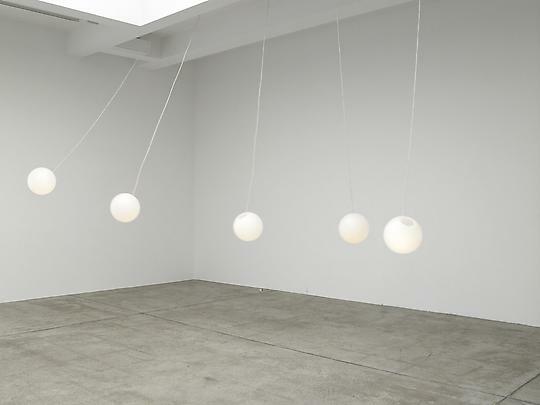 "Calumny (Envy, Hatred, Ignorance, Truth)", 2007, comprises five illuminated globes, filled with different "custom-designed" fragrances, that swing like pendulums. The scents they release blend and are impossible to grasp separately. Whilst the smells are immediate in their impact, they also function allegorically, referring to antiquity's most celebrated lost painting, "Calumny" by Apelles, eulogized by Pliny and later by Alberti in his "Treatise on Painting". In one of his typical takes on Western history, Macià subverts the visual and verbal: the olfactory is recognized as the sense which most easily over-rides our rational thinking, transporting us instantaneously to a different time and place. Aaron's Young's "Focus On the Four Dots in the Middle of the Painting for Thirty Seconds, Close Your Eyes and Tilt Your Head Back", 2007 is, in fact, not at all what it at first seems. Looked at as a traditional painting, it appears to be a somewhat generic, but abstract Warholian silk-screen canvas which seems to offer little unusual aesthetic revelation. However, when one follows the instructions of the title, a ghost-image hovers insistently - and disturbingly - on one's retinas. While the afterimage is deeply charged, it is also ultimately empty, a hollowed-out Pop cliché. Young was, in fact, handed the well-known image by a religious group on the street and, in a characteristically tongue-in-cheek gesture introduced it into the most secular of environments. However, the experience of the afterimage itself is a deeply private one, a form of perception that is rarely talked about, but experienced often, like black or white dots floating on one's eyelids, or afterimages one sees after rubbing one's eyes or looking at the sun. 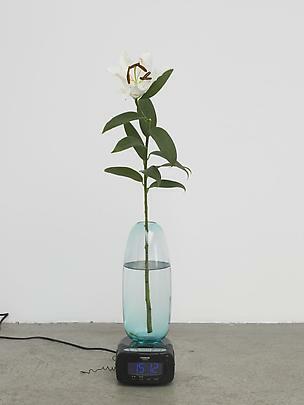 "Untitled", 1985, Dominique Gonzalez-Foerster's very first work is a seemingly ordinary combination of objects, a vase filled with a white lily standing on top of a digital clock. 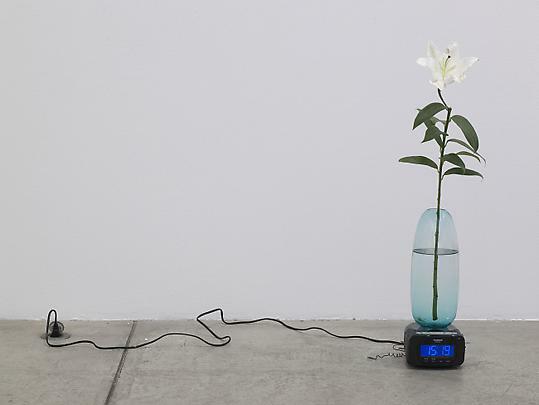 In a simple gesture, the passage of time is made manifest, the traditional symbols of vanitas and mortality - flowers and the hourglass-turned-digital clock – sit innocently on the gallery's floor. As so much of Gonzalez-Foerster's work, "Untitled" follows its own logic, being neither sculpture, nor installation, but simply inhabiting the real world. Yet, the flower never fully wilts, but exists in an extended state of freshness. 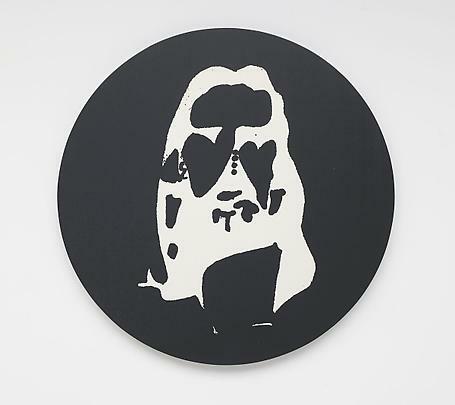 In "Slide Piece", 1972-73, one of his earliest projected images, James Coleman confronts the viewer with his or her act of perceiving taking place over time. The same color slide of an empty square in Milan is projected over and over again, accompanied by different narrated descriptions of the image. The text is recited by one speaker, but is the aggregate of many different readings, which at times are contradictory. None of the intricate descriptions can capture the image as a whole, it is only through repeated looking that understanding starts to occur. Coleman conceived "Slide Piece" to be realized in different languages as a kind of work-in-progress, putting emphasis on the cultural and sociopolitical specificity of looking and interpreting. 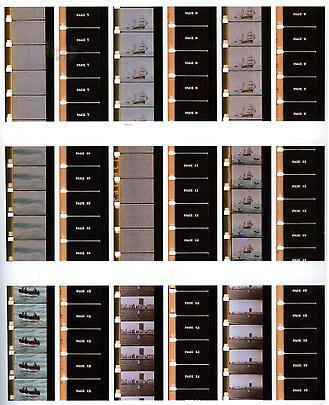 Similarly to Coleman's work, Marcel Broodthaers' slide projection "Bateau Tableau", 1973 and film "A Voyage on the North Sea", 1973-74 temporalize a static picture. 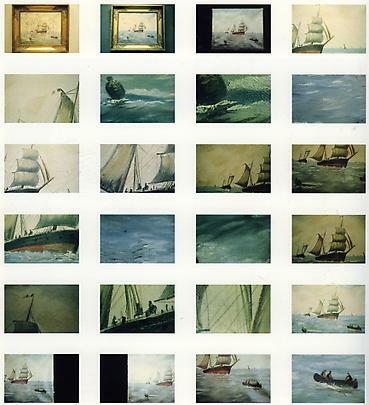 Both works are based on the anonymous 19th century painting "Un tableau représentant le retour d'un bateau de pêche", acquired by Broodthaers in a curiosity shop in the Rue Jacob. Using a still and moving camera, Broodthaers subjects the painting to his idiosyncratic, playfully ironic but prodding analysis, focusing on details and revealing normally unseen elements. 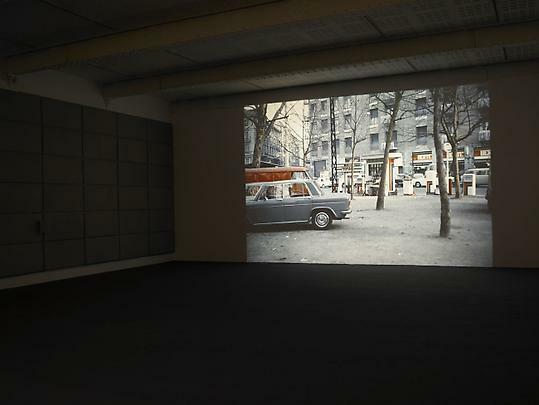 Both the film and slide projection (or "photo-film", as Broodthaers used to say), play with the opposition between total image and fragment and motionlessness and movement, mirroring the viewer's own act of perception.